It is my sister Bel’s birthday today and it was a good thing we do not have to go far, or spend a fortune either, so we can get her a lovely personalized birthday cake. There was a branch of Red Ribbon at the local Robinsons Place, just right beside Chowking, where my little man asked to eat pancit canton for the nth time, so we went to check that out first. I found out that they have affordable dedication cakes starting at Php299 for those who are in a budget. The price includes a personalized greeting to make the cake even more special and I was sold. We opted for this chocolate cake since it is one of our favorite flavors and am sure my sister will love it. I also had this sweet message added to give the birthday gal more reason to smile. Thank goodness there’s Red Ribbon Dedication Cakes, now anyone can get a reasonably-priced personalized cake and fast. Now I wonder when I can get another one? 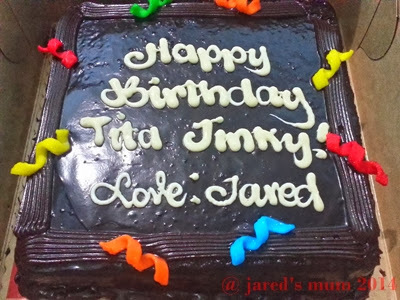 This entry was posted in desserts, food musings and tagged cakes, Red Ribbon on 3.February.2014 by admin. get free red ribbon ensaimada! A bite of a decadent ensaidma is really quite a treat especially on a particularly tiring, hot or boring day! But what do you say you have a taste of this delectable creations for free? You read that right, FREE! How you’d ask? 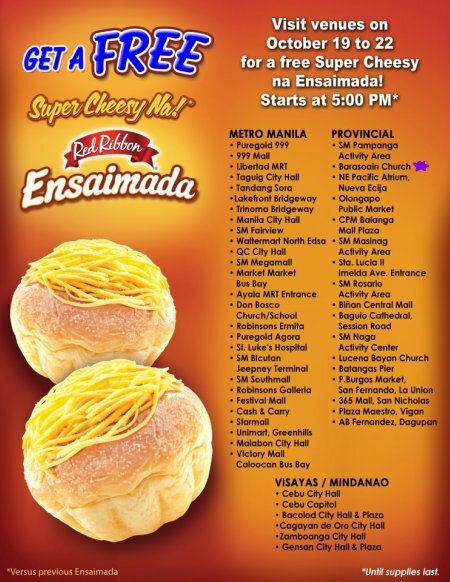 Just visit your local Red Ribbon branches between 19 to 22 of October starting 5pm. They will be handing out Free Ensaimada until supplies last! For more information, you can check out the Red Ribbon Facebook Page. This entry was posted in free grub and tagged breads, Red Ribbon on 18.October.2012 by admin.